It’s one week away from the filing deadline to run for the Legislature, governor’s office and Congress. We’ve gone through every race and talked with some insiders to get the scoop around the state. In each of the sections below we’ve pulled out some key races and trends in each area. We’ve also gone through the slog of putting bringing together every single filing into a handy spreadsheet that’s in the “Everything else” section. The filing deadline is 5 p.m., Friday, June 1. Candidates can withdraw from the primary election by 5 p.m., July 2 and withdraw from the general election by 5 p.m. on Sept. 2. The primary election is Aug. 21, and the general election is on Nov. 6. Did you know that there’s no one currently filed for the Alaska Democratic Party’s gubernatorial primary? Gov. Bill Walker has said he will join, but has yet to file and the one candidate who did file has since withdrawn from the race. There’s still talk that either Mark Begich or Bill Wielechowski could enter the race, potentially as a governor and lieutenant governor ticket (though we’ve heard that might not be totally realistic given they don’t really see eye-to-eye on resource development). Things are still looking pretty solid for Mike Dunleavy, especially when the field is Scott Hawkins and Mike Chenault who have neither mustered much support in the last few months. We hear that Chenault appears to be the rallying point for the anti-Dunleavy Republicans so he could stick in the race as things start to unfold. As always, there’s plenty of last-minute talk about another candidate entering the race. It’d be a tough bid given the momentum of the pro-Dunleavy campaign, but we’ll see. There’s a lot of talk among liberal and progressive Democrats about Alyse Galvin’s campaign for U.S. House. It sounds like people like Dimitri Shein well enough, but it sounds like there’s a lot excitement about Galvin and hope that she might be able to tap into whatever blue wave there is in Alaska. That would, of course, pit her against Rep. Don Young, who’s so far batted away Democratic challengers year after year. Surprise, there’s a lot going on this year in Anchorage and it seems to be getting more interesting by the day, especially when you count in Eagle River. Incumbent: Rep. Les Gara, D, likely retiring after 16 years. 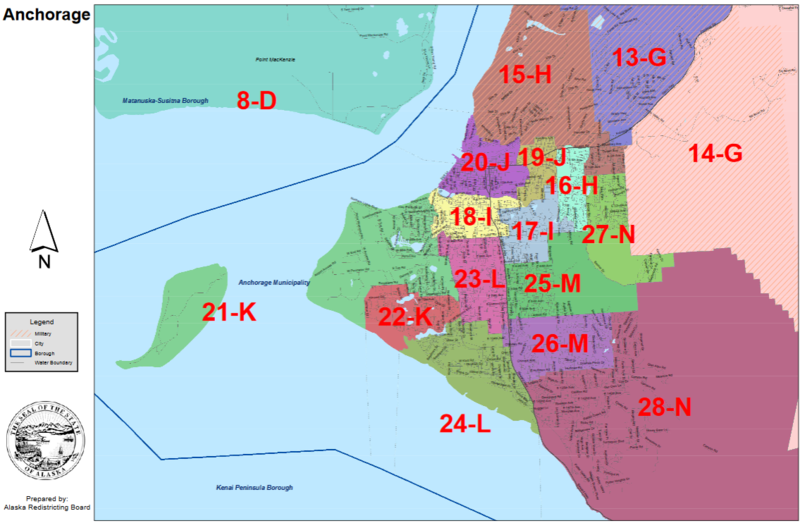 The biggest and most exciting development in Anchorage-area races this week is the open primary for House District 20, where Rep. Les Gara is stepping away after 16 years in office. Instead of anointing a successor in a last-minute switcheroo, Gara invited a contested primary in a Facebook post calling for anyone other than “one of the perennial candidate wannabe’s” to file for the seat. Already there have been two entrants into the race: Zack Fields and Elias Rojas. If the endorsements are anything to go by, the race is going to be a showdown of competing interests within the party. Both candidates have already amassed some pretty notable endorsements. 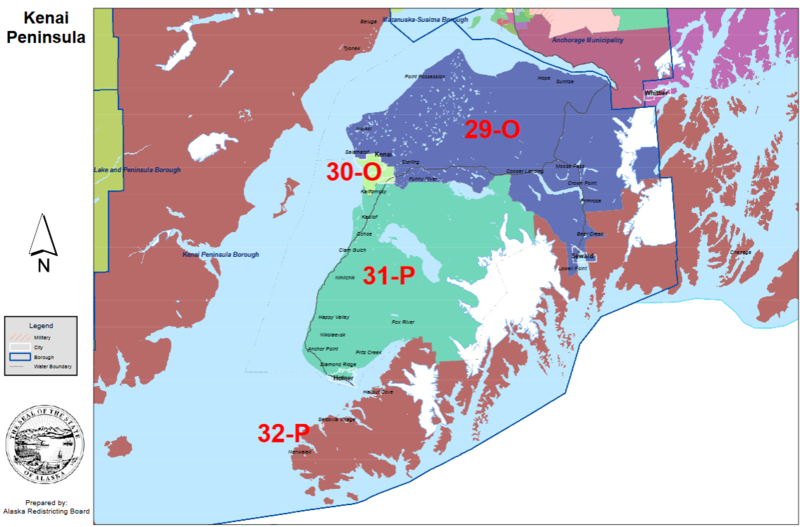 And that’s not to mention the race has already split the Begich brothers with Mark endorsing Fields and Tom endorsing Rojas. We’re told to watch for the pending endorsement of Johnny Ellis very closely. One insider described it as a race pitting the labor-friendly Democrats backing Fields against the more progressive wing of the party that’s backing Rojas. Still, the early money isn’t on the race becoming one of those bad-blood, party-splitting races, but we’ll see. The race also might not just be between Rojas and Fields, however, and we’ve heard there are possibly a few women who are considering entering the race. Both Reps. Charisse Millett and Lance Pruitt snagged razor-thin victories in 2016. Millett won by 93 votes while Pruitt won by 157. Democrat Pat Higgins will be giving the race another go after coming up short in 2016, and Pruitt will be facing the new challenger Liz Snyder. He, unlike Millett, will also be facing a primary challenge in Donald Jones. Democrats are banking on these turning out their way with other Democratic seats in potential limbo (the valley Juneau seat held by Rep. Justin Parish and the downtown Fairbanks seat held by Rep. Scott Kawasaki). On the flip side, Rep. Matt Claman will also be facing a rematch with Republican Marilyn Stewart, who he beat by 378 votes in 2016 for House District 21. Republicans are hopeful they can seize back House District 22 from the independent mitts of Rep. Jason Grenn, who beat Rep. Liz Vazquez by fewer than 200 votes. After the Republican recall attempt fell short (because it was filed with Anchorage, which is definitely the wrong place to file a recall over incompetence), there’s now three Republicans who’ve field for the seat including Vazquez. Republicans Sara Rasmussen and Hugh Hestand have also filed for the seat. Sideshow candidate Dustin Darden is also back in the race as a Democrat. He ran in 2016 as a member of the Alaska Independence Party, where he netted 730 votes. Don’t be surprised if another Democrat joins this race. Another contested primary in the Anchorage area will pit Reps. Lora Reinbold and Dan Saddler against each other. The two will be vying for the seat vacated by Sen. Anna MacKinnon after she announced she would not seek re-election this year. Rumors that Reinbold would seek the seat began circulating just about the same time that rumors about MacKinnon’s retirement began. Word is they may have run into each other at the Division of Elections office. This one ought to be popcorn-worthy. Democrat Oliver Schiess has also filed for the seat. Both candidates will leave behind contested Republican primaries for their open seats. House District 13, which was formerly held by Saddler, is shaping up to be between Craig Christenson and William Cook. House District 14, which was held by Reinbold, is shaping up to be a race between Eugene Harnett and Jamie D. Allard. No Democrats have filed for either seat. As always, the Interior has one or two big-ticket races with a few interesting lower-card contested races. 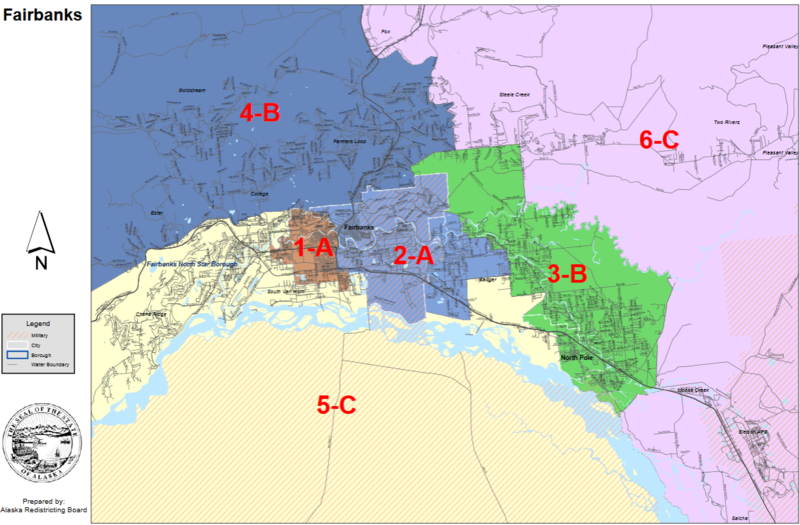 Fairbanks Democrats are still going up against some pretty difficult redistricting maps, which have so far seemed to tip the scale of every Senate seat in favor of Republicans. The race between incumbent Republican Sen. Pete Kelly and Democratic Rep. Scott Kawasaki will headline the Interior’s general elections and be one of the biggest contested general election races in the state come November. Kawasaki brings his strong campaigning and fundraising to Kelly, who’s been relatively safe in the carefully redistricted district (he won in 2012 while he wasn’t even in the country and didn’t have a big-ticket challenger in 2014). The interesting wrinkle that we’re hearing about in regards to this race is just what the involvement labor will have on the race. Kawasaki will likely need all the help he can get, but we’re hearing that some union halls might sit out of the race. Still, things must be making Kelly a bit nervous about the race as his campaign signs are already popping up around town and his ads are already hitting the Internet. Kawasaki’s decision to seek the Senate leaves open the downtown Fairbanks seat for a serious race between Fairbanks North Star Borough Assembly presiding officer Kathryn Dodge, a Democrat, and former Mt. McKinley Bank executive Bart Lebon, a Republican. At this point in the race, the seat is likely a toss up. Dodge has been campaigning and walking the district since last year while LeBon will likely have the money advantage thanks to the support of the Fairbanks business community. Rep. David Guttenberg announced his retirement from office after 16 years, opening House DIstrict 4, which covers west Fairbanks, Ester and the Goldstream Valley for an open race. His nephew, Grier Hopkins has filed to run as a Democrat and will likely bring the full union support to bear on the race. It’s likely his seat to lose because he’s well-known and well-liked in the solidly left-leaning district. Republican Jim Sackett and independent Tim Lamkin have filed to run in the general election. Rep. Adam Wool, D-Fairbanks, is currently the only candidate to have filed for the seat. He’s won by relatively safe margins in the last two elections, but we’re hearing that a Republican is likely to join the race. Except for House District 10, where three Democrats are lining up to vie for the nomination to take on Rep. David Eastman, there aren’t any Democrats who’ve filed to run for any legislative seat in the Mat-Su Valley. We’ve heard Democrats are planning to meet over the weekend with candidate recruitment on the agenda. Sen. Mike Shower, R-Wasilla, will have to go up against the two other main characters in the messy story of his appointment. Randall Kowalke, Walker’s off-list pick to fill the seat, and Rep. George Rauscher, the district’s pick who Walker skipped due to a controversial sticker making light of a recent alleged assault perpetrated by another legislator, have filed for the seat. This race could likely go all sorts of directions, which lead one insider to wonder why in the world Rauscher would want to risk it when his House seat would likely otherwise be a lock. Eastman won’t be going up against Iditarod icon DeeDee Jonrowe in the Republican primary after all, but he still can look forward to a primary challenge by Republican Mike Swanson. On the other side of the ticket there are three Democrats–Neal Lacy, Patricia Faye-Brazel and Su Kay–that have filed for the seat. House District 9 is one of two legislative races where the only currently filed candidate is not an incumbent legislator. Former Constitution Party candidate Pamela Goode of Delta has filed to run as a Republican for the seat held by Rep. George Rauscher, who’s going after the Senate. We’re told that if Goode is, in fact, the Republican nomination that the seat would be a prime opportunity for a independent or possibly even a conservative Democrat to pick up. There’s a lot of attempts to recruit challengers on both the Republican and Democratic side, but nothing fruitful has come of it, yet. It’s also a potential opportunity for one-term Rep. Jim Colver, the Republican who came up with the name for the “Musk Ox” caucus, to make a return. The local Republican officials don’t like him at all, and Democrats are a bit wary. There are three open seats in Juneau that are up for election, and just one Republican to go around. Word on the street is that unlike the rest of the state where independent candidates could be counted on to caucus with the Democrats, the Juneau’s independents may be more likely to join with the Republicans. Both Chris Dimond, who’s pursuing the downtown Juneau seat vacated by Rep. Sam Kito, and Don Etheridge and Larry, who’re going after Sen. Dennis Egan’s seat, won’t be joining the Democratic primaries and will be instead going after the general election. House District 33, the downtown Juneau seat, will have a contested Democratic primary between Steven Handy and Sara Hannan. Senate District Q is being sought by Democrat Jesse Kiehl. He’s also expected to be a lock, but like the Fairbanks race for Senate we’re told there could be an extra wrinkle with labor. The only independent planning to enter the Democratic primary is Rob Edwardson, a former legislative aide who’ll be pursuing Rep. Justin Parish’s generally conservative seat in the valley. He’ll face deputy mayor Jerry Nankervis, a Republican, in the general election. There’s really just one big race on the Kenai radar at the moment: the re-election bid of Rep. Paul Seaton. Rep. Paul Seaton, R-Homer, ran afoul of the Alaska Republican Party when he decided to caucus with the Democrats in the House. He’s paid the price more so than any other of the Republican legislators who’ve crossed over (Rep. Gabrielle LeDoux has just one Republican challenger and Rep. Louise Stutes has an nonpartisan challenger so far). Seaton, meanwhile, has four other Republicans who’ve filed in his primary race: John Cox, Hank Kroll, Sarah Vance and Robert Ruffner. Seaton faced Cox in a three-way primary in 2016 and won it with 48 percent of the vote with the two challengers splitting the remainder pretty evenly. The party anger has become red-hot this year, so it’ll be particularly interesting to watch. By our count, there are 12 races with just one candidate currently filed. The seat is currently held by Rep. Steve Thompson, R-Fairbanks, who’s the well-liked former city mayor. 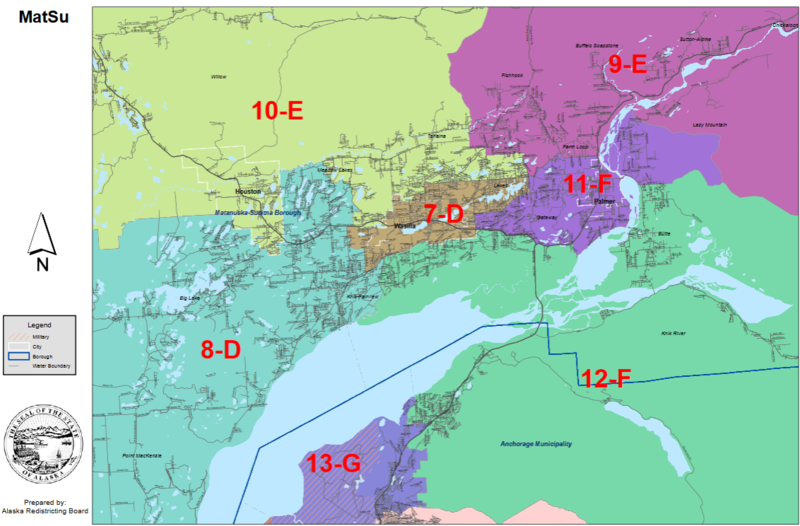 With an Army base that doesn’t really vote and the solidly Republican Badger Road area, the district has proven difficult for a Democrat to mount a challenger. There are plenty of Republican hopefuls waiting in the wings for whenever Thompson decides to step away. The seat is currently held by Rep. Tammie Wilson, R-North Pole. She may get plenty of hate from the rest of the state, but she’s also well-liked in the solidly Republican district. There’s perennially rumors about a moderate Republican challenger, but it’s unlikely to materialize. In 2016, Wilson saw a general election challenge from an independent candidate and a progressive Democrat. There was plenty of talk about getting the Democrat to drop out to consolidate the vote, but ultimately their combined vote still fell well short of a majority. Rep. Adam Wool, D-Fairbanks, is currently the only candidate to have filed for the seat. See the Fairbanks section for more context. The seat is currently held by Rep. Colleen Sullivan-Leonard, R-Wasilla. She’s the only candidate to have filed. House District 9 is one of two legislative races where the only currently filed candidate is not an incumbent legislator. Former Constitution Party candidate Pamela Goode of Delta has filed to run as a Republican for the seat held by Rep. George Rauscher, who’s going after the Senate. 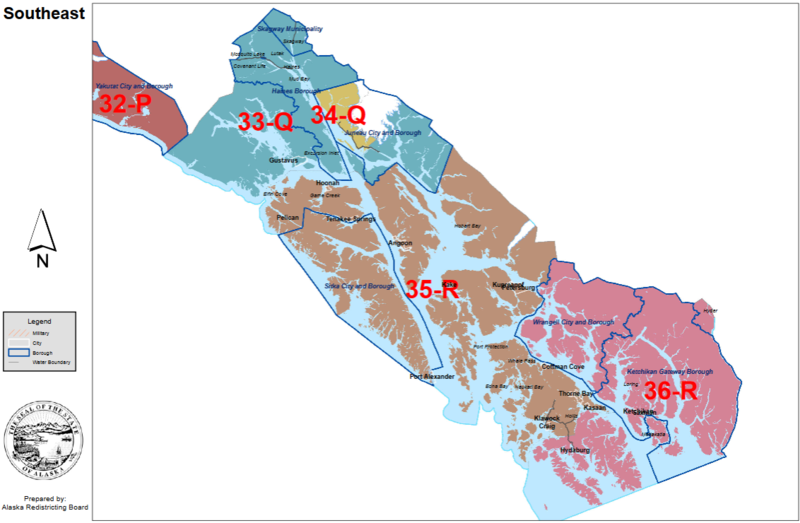 See the Mat-Su Valley section for more context. Incumbent Rep. Cathy Tilton, R-Wasilla, is the only candidate filed for her seat. There’s rumor that Anchorage Assemblywoman Amy Demboski, whose term is up next year, could be considering entering the race. Incumbent Rep. Gary Knopp, R, is the only candidate to have filed for his seat. Incumbent Rep. Dan Ortiz, I, is the only candidate to have filed for this seat. Incumbent Rep. Neal Foster, D, is the only candidate to have filed for this seat. Incumbent Rep. Click Bishop, R, is the only candidate to have filed for this seat. Former Anchorage Assemblywoman Elvi Gray-Jackson, a Democrat, is currently the only candidate to have filed for this seat. She was an early entrant into the race after Sen. Berta Gardner, D-Anchorage, announced her retirement. Gray-Jackson is respected and well-liked among the solidly Democratic district. Incumbent Sen. Lyman Hoffman, D-Bethel, is the only candidate to have filed for this seat. Be the first to comment on "Friday in the Sun (May 25): The Who’s Running for What edition"